Sub floor Fans Warehouse is an Australian owned and operated online store where you can easily find your underfloor and sub floor ventilation needs. We have a great range of fans, DIY kits and accessories conveniently available for you 24/7. Inadequate sub floor ventilation in your home can cause several long term problems such as mould, rotting and structural weakness. With an appropriate system, you can extract the damp air in your floor space and replace it with new air, making sure your home is healthy. We have a range of mechanical ventilation systems and solutions that are affordable and in many cases are DIY. 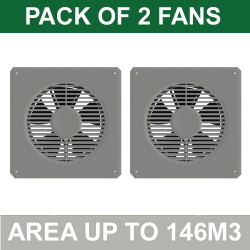 We have a range of underfloor / subfloor fans from inline fans to standard low voltage fans. Inline fans can be installed anywhere along the ducting and there are several installation methods depending on your situation. These inline sub floor ventilation fans are ideal for large areas where long lengths of duct is necessary. A low voltage fan can be installed in a wall and can be sufficient for small areas and do not require access to the sub floor. We dispatch our sub floor ventilation Australia wide. We will dispatch your order within 48hours and your products will be delivered to your door while you enjoy our low prices and great quality. We take your online shopping experience seriously and have in place several security measures to ensure your online order and payment is secure. We offer a secure ANZ payment method as well as the option to pay by bank transfer. Our site has an SSL certificate to help with the overall security of the Subfloor Fans Warehouse website. We are part of the Monster Warehouse group of online stores which includes specialist stores for Ceiling Fans and Pedestal Fans. See sidebar for logos that link to each of these sister sites.